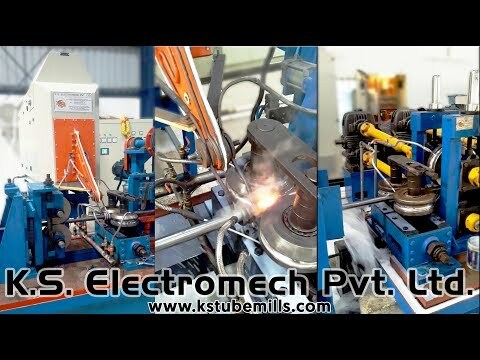 We, K. S. Electromech Private Limited, are one of the leading Manufacturers, Suppliers, Service Provider and Exporters of a wide range of Steel Tube Mills Equipment, Carbon Steel Tube Mill Equipment, Stainless Steel Tube Mill Equipment and Precision Tube Mill Equipment. In addition to this, we offer, Industrial Machinery and Parts, Natural FRP Cooling Tower, Cut Tool & Machines, Disc Capacitor and Cut To Length. Apart from this, we offer Control Panels - Custom Built, High frequency Induction Welders, E.O.T Cranes, Steel Tube Mill Projects Consultancy Services, Tube Mill Equipment and Capacitor. These products are manufactured using superior quality raw material procured from the reliable vendors of the market. Welcome to K. S. Electromech Private Limited Provide Stainless Steel Tube and Allied Machinery Parts & Services The Company was established in 2002, at Mandi Gobindgarh. We are a Trade member of NSIC and we cater to Australia, Africa & Europe. Excellent after sales support & customized solutions help us to serve Paper, Steel & Sugar industries. Steel Tube Mills Equipment, Slitting-Galvanizing & Pipe Lines are some of our products & services. We offer Electrical Panels, Industrial Machinery & Parts that are available at industry leading prices. Our Induction Welders, Heaters & Heat Exchangers are in huge demand across the global markets. Electric Overhead Travel Cranes & Pipe Mill Equipments offered by us are well known for their durability. We also provide Industrial Capacitors & Industrial Cooling Towers that are best in the industry amongst others. Our Steel Tube Mill Projects Consultancy Services are nothing but the best solution for all your needs.